After our previous analysis on salaries for different programming languages, we decided to analyse developer languages further. Specifically, we were interested to see which types of companies are hiring which languages. For this analysis, we categorised almost 500 companies according to team size and industry. We then analysed the hires these companies have made based on the primary programming language of each developer. 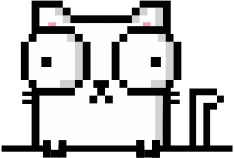 Startups: 5-25 people, developer team < 5, just closed first round of funding. Scaleups: 25-200 people, startup that has gone through multiple rounds of funding. Operating with disruptive IP. E-commerce: Companies that sell products online. Large financial firms: Banks, insurance companies, investment firms. Digital agencies: Companies offering visual, design and technical products to other companies. Similar to contract houses but usually serve smaller companies. Contract houses: Companies doing contract development work for large financial firms and consulting companies. 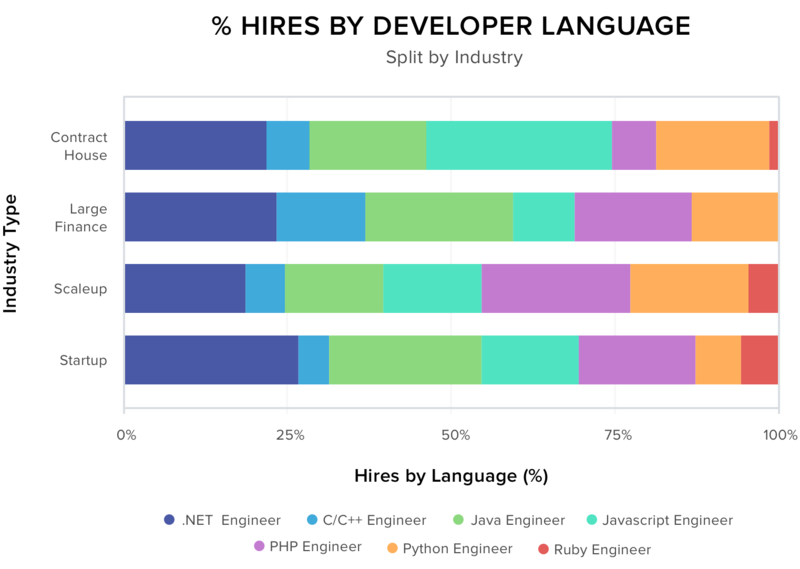 The graph shows an overview of the languages that each industry is hiring. Let’s break this data down into the three most conclusive findings. 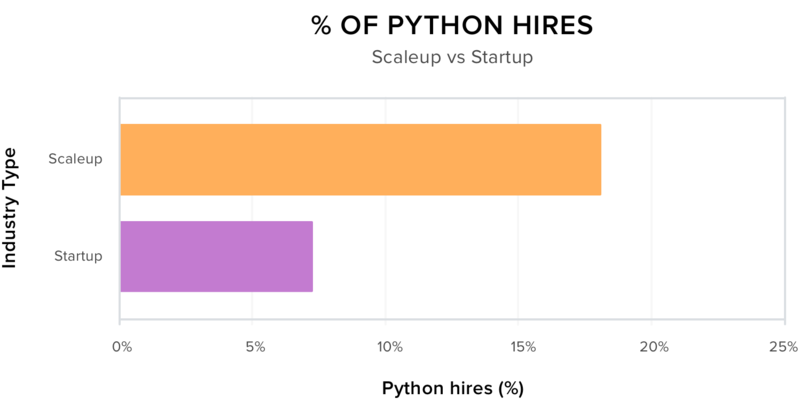 If you are a Python developer looking for a job, you might want to consider approaching companies that are a little more mature: Compared to 18% of developers at scaleups, only 7% of the developers that OfferZen placed at startups named Python as their primary language. Python (along with R) has become the language of choice for data analysis. What we could be seeing here is that, as companies grow, so does the amount of data they are producing. Data analytical problems could be more of an issue for scaleups than for startups. That would explain the difference in Python placements between the two similar sectors. 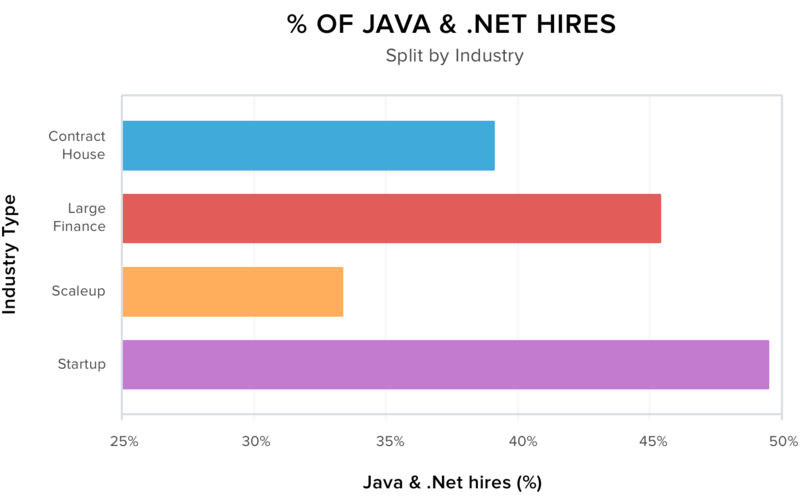 The large South African finance companies and startups on OfferZen are clearly invested in Java and .Net developers. Large finance companies are primarily developed in these languages and are expected to have a greater appetite for these developers. The startups however really surprised us as they are generally using a wider variety of languages. What we could be seeing is that the smallest companies on our spectrum are more flexible in adding other languages to their tech stack. It seems that, if you have PHP experience, you are better off in another industry than that of contract houses. 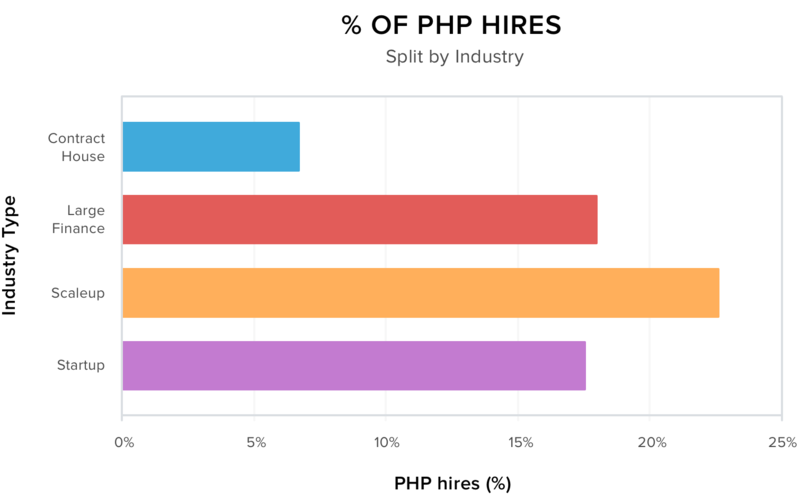 Their developer hires only consist of about 7% PHP developers whereas the other industries average around 17%. This makes sense because contract houses structure themselves around the requirements of their partners, normally large financial companies, with little demand for PHP. This, in turn, means that large financial companies could be getting most of their existing PHP work done in-house - a hypothesis our numbers seem to support. But what if you want to maximise your income? Which industry pays developers the most? 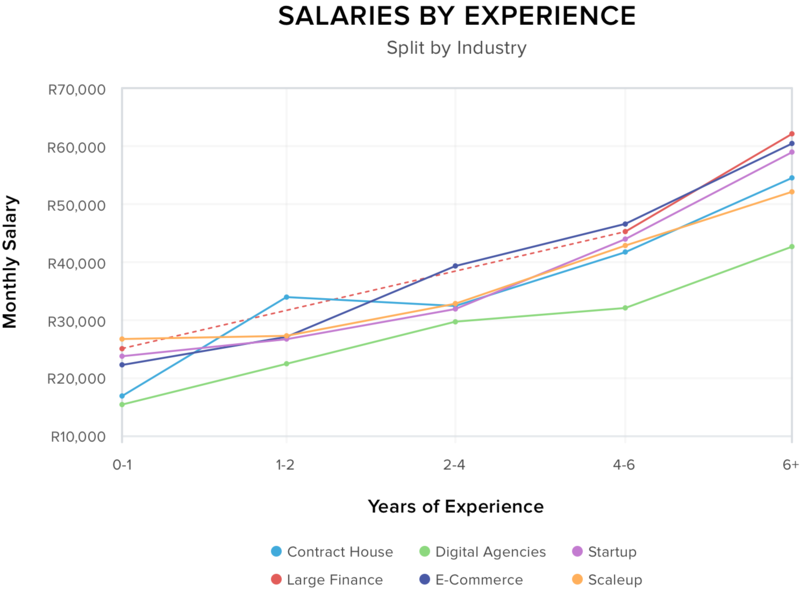 The salary spread for the different industries is relatively close - with one notable exception: Digital agencies pay less for developers with similar role experience compared to the other industries, reaching 23% less for developers with >6 years of experience. This is just an average. There are many developers that go to work at digital agencies and earn the same if not above average wages. If we want to explain the lower average in our graph, we would have to look at some of the other characteristics of digital agency work. The nature of the work is varied. Developers here get the opportunity to work in many different environments, using a variety of languages. This accelerates their learning and exposure. Our analysis result indicates that many hires on OfferZen aren’t just to maximise salary and that many other factors are at play. If you want to signup to OfferZen, or view the companies currently hiring on our platform, click here.